I was thinking of making some Christmas skirts for 2019 just so I could wear them to work. In previous years I have been a little reluctant to make Christmas themed clothing as you only get to wear it at one time of year but in recent months I have been wearing me made items to work nearly every day so I thought ok I can justify making clothing for Christmas as I can get multiple wears out of them for that month. On Sunday 9th December Rubyjam Fabrics posted on their Facebook page those magic words “Only 2 days left to get shipping before Christmas” They had some digital print glitter fabric which looked different and I wasn’t sure I would ever see something like that again. It is all the sparkles without the mess!! 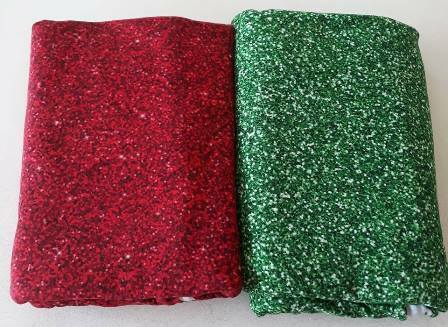 I decided to get both the green and red prints but didn’t put any pressure on myself to have them completed this year. There was indecision on how much fabric I should buy as I have a few skirt patterns that I could have used for this fabric and each required different lengths. I decided to go with 2m of each. The fabric arrived the Wednesday and was pre-washed that afternoon, the Friday I cut out the skirts and Saturday I was sewing them up. I don’t think I have ever had fabric that I have done that with. The pattern I used was my Turner skirt. This is a pattern hack of the Cashmerette Turner dress, it is the skirt portion plus a self drafted waistband. I went with this pattern as I know that it is comfortable and it is easy to make. This would be my Tried and Tested knit skirt pattern. It does take just under 2m of fabric which is a lot for a skirt but it is really worth it. The skirt is also a very quick make, I had them both done in almost a morning. This is without doubt ticking everything off my list. It is a cotton knit which makes them really comfortable and breathable. The shape of the skirt is really nice as it just floats of over the hips, I was given a lot of compliments when I posted pictures of them on social media which was lovely. As for quirky um hello GLITTER FABRIC I think that point is covered. I love my skirts. They both got worn last week to work and were very comfortable. What I really like about this fabric is even though I have made them in Christmas colours I can also get wear out of them throughout the year as they pretty skirts and it is only when you get closer to them you notice the pattern print besides who says sparkles are just for December. « Overlocker Why Oh Why!